WFT has recently applied its high fidelity surface relief plastic part replication process for optics to glass. Finished parts can be produced from in-house originations and customer supplied masters. 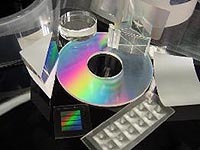 Typical applications include diffusers, deep structures, and diffractive surfaces made holographically or computer-generated. These glass replicas can withstand wafer cutting and temperatures over 100° C. Replicas can be made in small odd shapes or very large sheets.